Probably the best table in Europe! 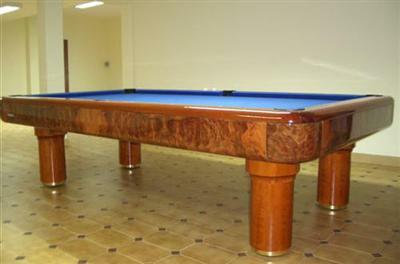 Two finishes available-Briar of Mahogany (Birdseye) and Feathered Mahogany. Frame made from Italian matured solid wood with cast iron support. Very little if any leveling needed. Diamond sanded frame and slate results in a precise playing surface. Rails and aprons solid wood and double layered plywood. Solid wooden tube legs. Three piece genuine Italian slate 30mm. Standard American size pockets. Hardened rubber as opposed to plastic. Less noise. Supplied with balls, cues, triangle, chalk, tablebrush and tablecover.